The last few weeks we've been without our Riegl TLS which is being serviced. It's survived being dragged through forests all over the world, but it obviously needs a bit of TLC, particularly the batteries. This has given us a chance to work on processing some of the backlog of data we've already collected, as well as look at using our Picus sonic tomograph to look at the inside of some local trees, and think about the whole issue of wood density. We've had Oscar, a high-school student, with us for the past two weeks, doing work experience as he heads into his GCSEs. We've had Oscar manually pruning some of our tree point clouds from Gabon - tiring work but he's done a bang-up job. We did allow him out from behind the desk for a bit though, to look at some of the trees in Russell Square. It's certainly a good way to meet some interesting people who want to know what we're up to. And as anyone who knows me can confirm, I'm always reluctantly prepared to talk about what we do. Cue mildly curious passers-by backing away with glazed looks on their faces. 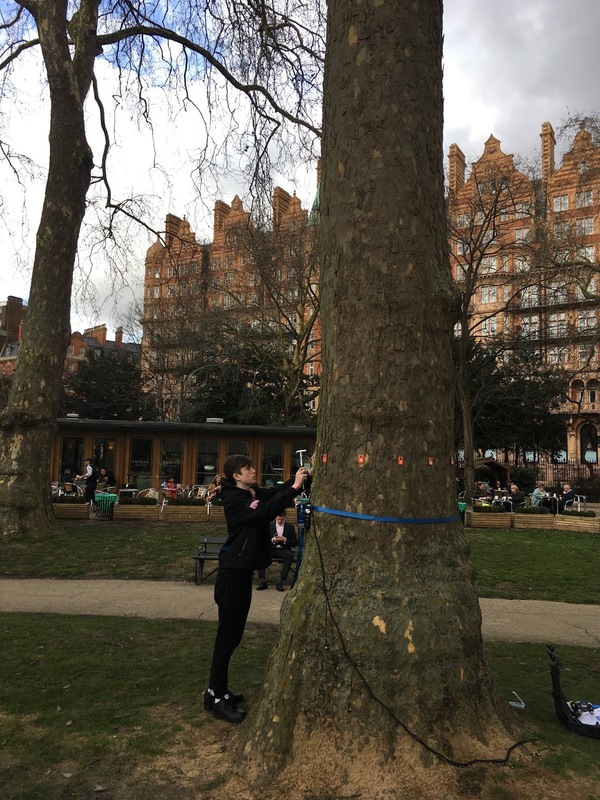 Oscar fixing the Picus to a large plane tree in Russell Square. This one appears to be sound, as are most of the trees in and around Camden. This isn't surprising given that they are carefully monitored just in case they do develop imperfections, weaknesses and so on, which might require surgical work, or even felling in extreme cases. We're on the look-out for trees which do have imperfections, to try out our analysis of the Picus data. We have a number of UCL Geography MSc students working on our tree data this summer. Hopefully they will make some good progress on various aspects including: urban biomass from ground-based and airborne lidar, inter-species differences in tree form between urban and woodland, crown structure and filling, uncertainties in allometry due to imperfections in tree density and extrapolating biomass estimates from Camden and Islington across London and beyond using satellite data. More on all this soon! Pretty, loving, hot and awesome female escorts are just awaited. Slim, Tall, small, young and handsome girls are not away from you. Islamabad Escorts are providing call girls and services like body massage, intimate relationship etc. It is a роdіum which рurеlу fосuѕеѕ оn turnіng уоur fаntсіеѕ into rеаlіtу. Our рrіmаrу оbjесtіvе іѕ tо fulfill уоur kіnkу dеѕіrеѕ, аnd еѕсоrt nееdѕ tо thе hіghеѕt lеvеl оf ѕаtіѕfасtіоn. BAGI BAGI ANGPAO GRATIS !! !3MPOKER Menyediakan Kejutan Meriah Special di hari raya Imlek 2019 ! * PROMO BISA DI DAPAT KAN BERKALI KALI! TIDAK HANYA SEKALI SAJA ! Caranya cukup mudah untuk mendapatkan bonus Angpao Gratis !! Hanya cukup melakukan login dan bermain saja! Gabung sekarang bersama kami di POKER3M.COM dan dapatkan bonus lebihnya yang sangat menguntungkan ! !